Our Seattle web designer specializes in designing and building your online presence through functional, beautiful websites. To say that we are passionate about web design is an understatement. We are actually obsessed. Even after years in the web design industry, we find our work fun and challenging. It is rewarding to see the results of our efforts and the success they bring to our clients. We understand that you have many options when choosing a web design agency. We also understand how important this decision is, and it is a responsibility we take very seriously. Your website is about your business and your goals, not ours. That is why we make it our priority to carefully listen to you through the entire planning, design and development process. We are experts when it comes to website design, search engine optimization, digital marketing and all things tech. 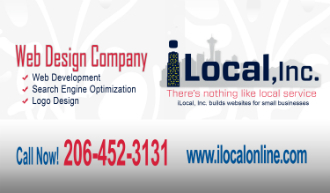 Visit iLocal, Inc. today at 92 Lenora St Seattle, WA 98121 to discuss your project needs. You are only a step away from improving your brand identity as well as your bottom line. Being a local website design company in Seattle means that we need to be contactable and you need to speak to actual people when you call. Your will always find us near to a phone. Call us on 206-790-1999 to know more about our website design services for Seattle businesses.